Osteoporosis occurs when a person’s bones become brittle and weak. This condition is most often associated with older women who have gone through menopause, but it can affect men too! This is a serious condition that can lead to painful and deadly complications. Osteoporosis itself rarely kills, but when the bones become brittle, they are far more likely to break during a fall or accident. It is all too common for an older individual with osteoporosis to break her wrist, spine, or hip due to a fall, even a minor slip! Once a bone is broken, it can take a long time to heal or never heal properly at all. According to the International Osteopo​rosisFoundation, osteoporosis is a contributing factor to 8.9 million bone fractures annually. Additionally, a person who suffers a hip fracture due to osteoporosis has a 20 to 24% chance of dying in the first year after the fracture. This information shows just how critical it is for men and women alike to make an effort to prevent osteoporosis. They can do this by staying active, performing weight-bearing exercises, and taking supplements that support good bone health, like Osteo Source from Super Good Stuff. 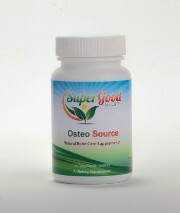 This powerful supplement was designed to protect bones from density loss and to stave off osteoporosis.